Background : Son of Reuben. 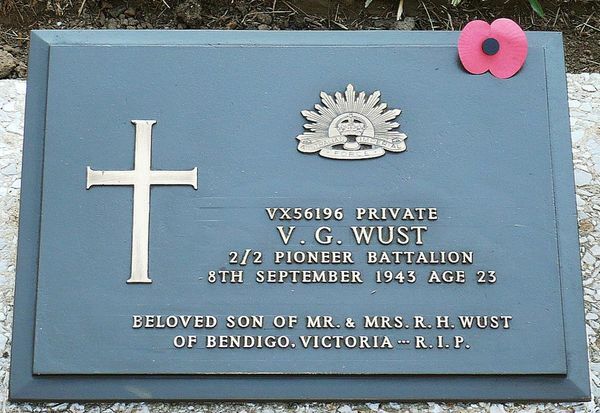 Henry and Florence Elebeth Wust, of Bendigo, Victoria, Australia. 22/05/1941 Leave without pay 22/05/1941 to 25/05/1941. 04/06/1941 Transferred to Southern Command Engineering Training Depot Puckapunyal, Seymour, Victoria. 05/06/1941 Transferred from Recruit Reception Depot Royal Park, Victoria. 08/07/1941 Graded Group II Cook (Subst). 03/09/1941 Embarked on H.M.T. G.G. Sydney, New South Wales. 10/11/1941 Marched out to 2/2 Pioneer Battalion Middle East. 12/11/1941 Taken on strength from Pioneer Training Battalion. 21/01/1942 Relinguished Group II Cook. 11/04/1945 Died of illness (cause not stated) whilst prisoner of war on or after 01/09/1943.